Community Trust Bank, Inc., founded in 1903, is headquartered in Pikeville, Kentucky. The Bank currently has 70 banking locations across eastern, northeastern, central and south central Kentucky, six banking locations in southern West Virginia, and four banking locations in Tennessee. 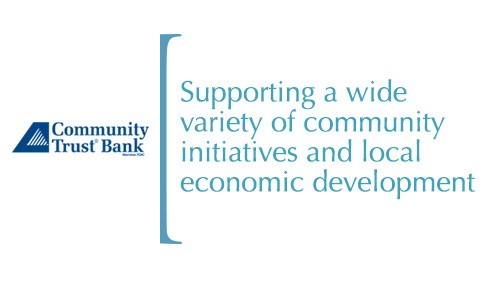 Community Trust Bank provides competitive products and services with a “community banking” level of service. The Bank offers consumer, residential, and commercial lending options to new and existing clients, as well as offering a variety of financial solutions to individuals and businesses including the acceptance of time and demand deposits, providing cash management services to corporate and individual customers; issuing letters of credit; renting safe deposit boxes, and providing electronic banking and funds transfer services. Community Trust Bank was honored in 2018 for the ninth consecutive year with the "Gold Lender Award" from the United States Small Business Administration (SBA) as Kentucky's top volume SBA 7a Community Bank lender for the federal fiscal year 2016-2017.